Hello and welcome to the seventh occasion of Räbinä Awards! It is hard to believe for me, but RA serves the community for such a long time. Thank you for the support, let's keep that attendance this year, too! If you wouldn't know anything about Räbinä Awards, it's so to say the Oscar gala of GeneRally, where YOU may elect, who should receive the prize: one year fame! To know more from previous awarded members, make sure to check the spoilers. Community Member - TuomoH, jo.sk and Raska. Competition Organizer – James C.
So lets see who deserve to get Golden Räbinä this year! Don't forget to read the rules, either! 1. Introduction: Räbinä Awards is annual election of Trackmaker, Carmaker, Competition organizer, Commentator, Rookie and Community member of the year from members of GeneRally community. Räbinä Awards are organized by Räbinäs Awards Committee. A. 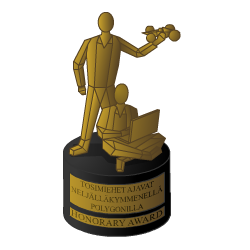 Every member of the GeneRally International Forum is allowed to nominate. C. Only a member of GR community, who posted first time in GRIF from 1st Jan 2014 to the end of year 2014 and had not posted previously at past official forums, is nominateable for category Rookie of Year. D. Member may not nominate himself. E. One member may nominate up to 7 members for each category. G. Member may nominate a nominee by sending a post in the nomination thread. The post must include the nominee's name and the category, which is he nominated for. H. Members may nominate until 23.59.59 GMT of 1st February 2015. A. Every member of GeneRally International Forum may vote in all categories or in some of them. B. Member may vote for one nominee per each category from its nomination list. C. Member may not vote himself. D. Member may vote by sending a private message to Buka. F. Members may vote until 23.59.59 GMT of 15th February 2015. C. All votes (including its reasoning) and summarized results will be published in GeneRally Gala Thread 2014 as soon as possible after the end of voting term. D. The Committee may decide about awarding a member by Committee Honorary Award. The nomination and election rules aren't applied to this category. E. Racer of the Year Award is given according to the GeneRally World Ranking results in collaboration of the GWR and the Committee. The nomination and election rules aren't applied to this category. F. The winner of each category will be awarded by Golden Räbinäs. If you have have suggestions or you disagree with some part of rules, please say about it in Räbinä Awards discussion thread. Last edited by Herbal on Thu Feb 05, 2015 3:23 pm, edited 9 times in total. Last edited by zgr on Sun Jan 04, 2015 11:35 am, edited 1 time in total. Where is Racer of the Year? Last edited by ivaneurope on Fri Jan 09, 2015 4:08 pm, edited 1 time in total. We're at around the halftime of nomination period, do not forget to nominate those, whom you're still missing from the list! One week remaining until nominating your bests for this year's Räbinä Awards! About two and a half day remaining from the election phase of 2014 Räbinä Awards! Do not forget to nominate your bests of last year! I think we can even now start voting. Who we can nominate more, if we have nominated almost everyone? Wait! I got one for carmaker left: Lorenzo. It's a shame, he is so talented but I can hardly find any of his cars. @ Rudy: it certainly is a shame that Lorenzo is missing from nomination list, but as he didn't release anything last year, I am not going to add him to that. BTW voting phase has started yesterday, you should send a PM to Buka for voting your favorites. Deadline is, as stated in the first post, 15th February, 23:59.59 GMT! You have 10 days to send your votes to Buka! Do not forget, that you can elect one person in each category. As stated in the rules in first post, you may give a short reason, what your motives were in the election. I advise you to use that out! Eight days to go until end of election phase. Buka, if you're reading these messages, could you please post here the list of people, who have sent you a PM? 10 people so far - RobertRacer, ZGR, Marcinho, YoNnie, puttz, XYY, FRUKIScze, Jo.sk, Trigger Happy and Gzehoo.